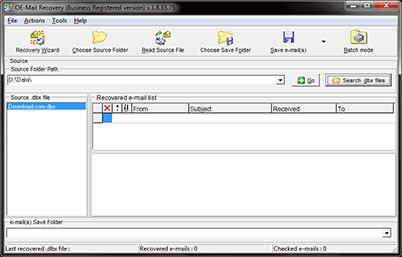 OE-Mail Recovery (download) is a tool for repair damaged/corrupted Outlook Express folders. OE-Mail Recovery reads damaged .dbx files in which Outlook Express stores folders and identifies e-Mails stored in them. The recovered messages can be viewed and stored the .eml file format later. The recovered messages can be opened by Microsoft Outlook Express and easy moved/copied to its folders or any other programs. The program has wizard for easy Outlook Express repair. With the wizard's help you'll make Outlook Express Repair for 5 steps. The special knowledge isn't necessary for Outlook Express repair. OE-Mail Recovery is like insurance for your Outlook Express e-mails. The tool can repair Outlook Express dbx file in a batch mode. If you unexpectedly haven't seen the emails in the Outlook Express folder and it is necessary for you recover Outlook Express take advantage of OE-Mail Recovery. OE-Mail Recovery is easy to use outlook express repair (OE repair, Outlook Express Inbox repair tool, recover dbx) tool for fixing dbx file. Select a DBX file named like a folder in Outlook Express. For example, Inbox.dbx file is Inbox folder in Outlook Express. Select save folder on HDD to save repaired messages. Moving up the damaged dbx file from Outlook Express store folder. Click on repairable folder. New empty .dbx file will be created in Outlook Express store folder. Drag-and-drop selected messages from Windows Explorer into new created Outlook Express folder. Outlook Express Error 0x800420CB: Message Could Not Be Opened From Outbox Folder. With this tool you can repair Outlook Express folder easily. It not only the utility for repair or recovery. OE-Mail Recovery helps to save the selected messages on a disk, to migrate the outlook express folders on another computer and so on. The program repair a Outlook Express emails a whole and to check a messages before adding in a list of repaired messages. The recover dbx tool can repair Microsoft Outlook Express file through local network. Recover Outlook Express damaged store file for a different customers identities. The dbx recover tool can read password protected dbx file of user's Identities. Support the Outlook Express database recovery in a Batch mode. Support to repair dbx files with a size up to 4Gb. Outlook Express files recovery tool support to repair dbx files with a 2Gb problem. Outlook Express repair files tool support Windows 98/ME/NT 4.0/2000/XP/2003. Outlook Express folder repair tool Repair of the attached files is obligatory. Recover the corrupt Outlook Express Inbox. Repair file dbx through local network. Note: The tool don't designed for a recovering Microsoft Outlook pst files. Our company offer use Outlook inbox repair tool - Outlook Recovery Toolbox for a recovering Outlook PST files. How to repair Outlook files you can read on page - Outlook file repair overview. The Outlook Express dbx file recovery software distributed under the "Try before Buy" License. How to Repair an Outlook Express folder? An awful thing can happen to any Outlook Express user: you run Outlook Express and open the folder containing the necessary information just to find it empty. Outlook Express can't read the folder and does not see your messages. It's hard to imagine what you may feel at a moment like this. You ask yourself how to repair the Outlook Express folder. How to repair Outlook Express and to get back all the lost data? Is it difficult to repair Outlook Express? How to fix Outlook Express 6? We will try to help you repair the damaged Outlook Express folder and describe the entire process of repairing Outlook Express step by step. 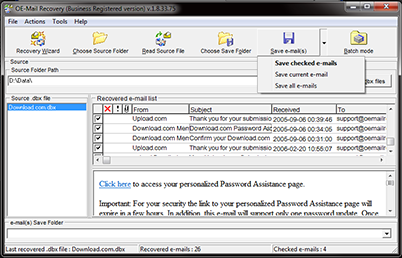 OE-Mail Recovery is a corrupted Outlook Express inbox recovery tool designed for repairing the Outlook Express database. Outlook Express stores all messages in files with the dbx extension. In this case, one Outlook Express folder corresponds to one dbx file. As a rule, the names of dbx files coincide with the names of folders, e.g. the file Inbox.dbx corresponds to the Inbox folder in Outlook Express. Therefore, the Outlook Express repair procedure comes down to repairing dbx files. This tool helps you in case the Outlook Express inbox is corrupted. The tool can repair Microsoft Outlook Express files via a local network. OE-Mail Recovery Outlook Express dbx fix tool and helps to repair the corrupt Outlook Express Inbox and Outlook Express 6.0 repair tool, repair Outlook Express email tool too. Step 1: Extracting messages from the damaged dbx file. A special tool is required to extract messages from a damaged Outlook Express folder and we offer you the OE-Mail Recovery program for this purpose. There is an easy and convenient wizard in OE-Mail Recovery that will help you extract all messages from your damaged Outlook Express folder in five steps. Besides, the wizard will easily teach you how to work with the program and repair Outlook Express. OE-Mail Recovery will give prompt you the folder where Outlook Express stores its dbx files. In this case, the only thing you have to do is to select the file that should be recovered and start the Outlook Express repair process. The time required to repair Outlook depends on the size of the damaged file. When the process of repairing Outlook Express is over, you will see the list of recovered messages. You can look through them the same way you do it in Outlook Express. When the Outlook Express repair process is over, it is necessary to save the messages to the hard disk. OE-Mail Recovery allows you to select the messages you want to save when you view the repaired messages without closing the program. Step 2: Backing up the damaged dbx file. OE-Mail Recovery showed you the path to the Outlook Express file storage. And now save the damaged dbx files to a safe folder, they can be useful. Step 3: Creating a new Outlook Express folder. Remove the damaged dbx files from the Outlook Express folder. Run Outlook Express, click the folders whose dbx files you have just removed and Outlook Express will automatically create new empty dbx files. Step 4: Copying extracted messages to the new Outlook Express folder. To move the repaired messages to the new folder, you have to simultaneously open Outlook Express and Windows Explorer, select the repaired messages in Windows Explorer (use Shift + arrows keys or Ctrl + the left mouse button to do it), capture them with the mouse and drag them to the new Outlook Express folder. The Outlook Express repair process is over and you get a completely repaired Outlook Express folder. So, problems with the Outlook Express inbox have been solved. Outlook Express files have been repaired. The OE-Mail Recovery program is like insurance for your messages, it allows you to repair archived dbx. It is Inbox repair tools in a most cases, helps OutlookExpress repair and repair Outlook inbox, Outlook Express 6.0 repair, dbx file repair. With OE-Mail Recovery, you can solve problems with the Outlook Express inbox. 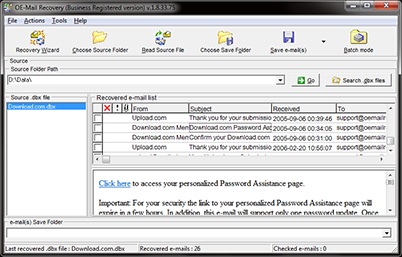 OE-Mail Recovery is an Outlook Express inbox repair tool or an Outlook Express dbx repair tool. This Outlook Express repair kit is easy to use. The tool repairs the corrupted inbox of Outlook Express and Outlook Express 6. You can use OE-Mail Recovery to recover a corrupted inbox in Outlook Express. Repair Outlook Express Windows 98 dbx files and repair the Outlook Express database. If the Outlook Express inbox is corrupted, you can repair it without any special knowledge, the Outlook Express dbx repair procedure is easy and simple. The Outlook Express 6 inbox repair tool repairs Outlook Express dbx and dbt files. The Outlook Express dbx file recovery software has an easy-to-use wizard that will help you learn the Outlook Express repair procedure. The Outlook Express file recovery tool repairs corrupted Outlook Express folders (Outlook Express repair dbx files). Recover damaged Outlook Express files where different identities are stored. OE-Mail Recovery isn't a Microsoft Outlook 2003 repairing tool. You should use Outlook Recovery Toolbox to repair Outlook 2003.